The Cubs have not won the world series in 100 years. 0 world series 100 years. I believe that there are 30 teams in the league. If you do a simple Binomial Distribution on 100 trials each with a 1/30 chance of success, you have a higher statistical chance of coming up with 1,2,3,4,5 and 6 successes over those 100 trials. Just by dumb, random luck, it would be easier for the Cubs to have won 6 world series (6.7%) championships than 0 (3.4%) in the past 100 years. And, of course, there have not been 30 teams for most of that time. I do not want to go through the effort to calculate the actual odds, but winning 0 times in 100 years is even harder than my simple little calculation. Don't worry, Cub Fans. By my calculation, it is nearly statistically impossible (odds are only about 1 in 1000) for the Cubs to make it to 2108 without winning one. Of course, if any team can do it, it is the Cubs. I got my first shipment from Mr. Beer today. Actually, it is my second shipment, as my sister had the first one sent as a Christmas Gift. My first batch of beer has been carbonating for almost a week, which means it is almost ready to put in the fridge to condition. I'll probably try my first taste of it on Super Bowl Sunday, which will be three weeks since I started brewing the beer. People on the Mr. Beer discussion forum seem to agree that it is better to follow a 2 - 2 - 2 pattern. That means two weeks to ferment, two weeks to carbonate, and two weeks to condition. The forum entries say that is the minimum, and for higher fermentable sugars (more alcohol) you should ferment longer and usually condition longer. So, I am not following the wisdom of the masses, but I think it will be OK for my Classic American Blond Ale, which is very low in alcohol. I am following exactly what the instructions said to do for this one. I will start following the 2 - 2 - 2 for my next batch. 6 weeks!!! Man, it takes patience to brew beer! So, now that I got my first shipment, I am going to start brewing batch #2. I have decided to try a recipe from the Mr. Beer site called 1776 Ale. It is a hoppy, amber beer with a modest bitterness (IBU 11) and an alcohol by volume of 6%. My guess is it is going to be sort of similar to a Sam Adams Boston Lager or maybe a Breckenridge Brewery Avalanche, but I do not really know. The recipe includes the hopped malt extract "Cowboy Golden Lager", and a "Booster", both of which I already had from my original kit. It also calls for an unhopped malt extract "Mellow Amber" and some extra hops both of which were in my shipment. My shipment also came with another hopped malt extract and unhopped extract for which I have a plan. I may or may not describe this brew on the blog once I start brewing it. I really want to get it all going. I want to know how they all taste now. The hardest part of brewing your own beer is the waiting. Of course, right now, I do not even have enough bottles to bottle any more. By the time I am ready to bottle batch #2, I will though. Shipment #2 includes another set of the PET bottles , and of course more beer ingredients. My friend Diana DeGette, chief deputy whip of the house of representatives, sent me an email. I did not realize we were friends, but right there at the beginning of the email, she said it. Not only am I a friend, but I am a Dear Friend! Had I known we were so close, I might have voted for her. I want my friends to be successful. And, she is. Actually, she did not need my vote. My congressional district was not even close. Enhancing and expanding the children's health care program to provide coverage to millions of low-income children who live daily without health care. I am a little surprised that D did not list first and foremost that her #1 priority did not have something to do with getting the U.S. economy on the right track or getting our over 1 trillion dollar budget deficit under control, or maybe something about helping to create high-paying jobs to replace the close to record number lost around the country last year. I guess that even though we are dear friends, we do not always agree on what is most important. Quite frankly, the deficit scares the hell out of me. Getting the budget under control seems like it should be everyone's top priority. But, I am a simpleton, because I don't quite understand how it is that the country can exist at all in the financial state we are in. I do not even understand how any president can in good conscience even submit an unbalanced budget, let alone one that is over a trillion dollars over. If you cannot even start with the concept of more money coming in than goes out, how are you going to finish with anywhere close to blackl? And, if you have nothing to fall back on, how do you survive tough times? I have a hard time comprehending 1 trillion dollars at all.... let alone the 11 trillion dollars of debt we currently have. Now, Obama is telling us the budget will be over by more than 1 trillion dollars for the next couple of years. How can this not be alarming? How can this not be every congress person's number 1 priority? If you laid one dollar bills end to end, you could make a chain that stretches from earth to the moon and back again 200 times before you ran out of dollar bills! One trillion dollars would stretch nearly from the earth to the sun. It would take a military jet flying at the speed of sound, reeling out a roll of dollar bills behind it, 14 years before it reeled out one trillion dollar bills. You can probably do the math for 10 times that number (and then realize that the total is worse than that). Personally, I have never held a debt greater than I could (if I absolutely had to) pay off if I needed to. A big part of that I owe to my parents who saved and gave me enough money for me to go to college. As it turned out, between scholarships and co-op jobs, I used very little of that money, so ever since I was on my own, I had a pretty large nest-egg. Plus, I've always saved as much as I could. My 401 and IRAs have always been fully funded and I have saved much more than just those vehicles. There have been times, early on after college where my budget was hard to balance and maybe I had to rely on the fact that I had savings for a month or two. But, that is one reason it is so important to save when you have an opportunity. So, over the years there have been lots of possessions or services that technically I could have obtained that I did without because it was more important to me to be in a position where I could rely on my savings in the event that I ever needed to. And then, we have the government. According to http://www.whitehouse.gov/omb/budget/fy2008/summarytables.html , the federal government budgeted to spend almost 3 trillion dollars in 2008. The revenue was projected to be about 2.6 trillion. According to the news, the delta is even worse (much much worse), but even using those numbers, we are talking being over budget by a four hundred billion dollars. Mr. Obama tells us we will be something like 1.2 trillion dollars over for the next couple of years. So, we have a budget that tells us we will be in debt, and then we are not even able to come anywhere close to following the budget. I probably do not need to point out that if I ran my household budget anywhere close to how the government runs its "household" that I would probably be living on the street. My wife would not like that very much. But, for some reason, the federal government is able to plug along without too much concern. Again, I do not see how this is not the #1 priority for everyone in our federal government. But, stem cell research is important too I guess. Well, as I mentioned in a previous blog entry, I got a Mr. Beer home brewing kit for Christmas. Thanks again, Tera. Yesterday and today I spent some time on the web site. I was surprised to learn that Target carries Mr. Beer refills. That is nice to know. I guess Home-Brewing is pretty mainstream if you can get all you need at Target. I figured I would have to go to a special home-brewing store or order everything from the Mr. Beer web site. Anyway, this morning, I started my first batch of beer. It was just one of the brew packs that came with the kit. Classic American Blond Ale. It is probably a nice start for a beginner. Thanks to the Mr. Beer packs, making the wort is extremely easy, and not really all that time consuming. At the moment, the brew is fermenting down in our basement. As I look at the Mr. Beer website, I have all kinds of things I want to try. There are tons of different recipes on the website. I can experiment on my own with different flavors. There is a web page at the TommyKnocker brewery website that says to feel free to contact them for tips and recipe ideas on their beers, so of course eventually I'll want to try to recreate some of their beers. I just reserved a couple of books at the library that have recipes for popular beers. There are tons of things I want to do in my mini-micro-brewery. But, I have to wait at least a week before I can even bottle my first batch. It is better to go longer, so I will probably let it ferment for at least 2 weeks. Then, carbonation takes at least another week. Again, I will probably want to let it go longer. Then, It will take me awhile to drink two gallons of beer. At the very soonest, it will probably be a month and a half before I can start my next batch. And, I was planning on just doing another standard batch on my second attempt. So, by the time I can start experimenting, it will be March or April; maybe even June. I want to get started RIGHT NOW. This makes me think I need another kit or two. Obviously, it is premature to go that far. But, if I end up liking this as much as I think I will, at the very least, I need a second set or two of bottles . It also means I will have to think very carefully about what I will want to try. Each batch is at least a 2 week commitment before I even know what the beer will taste like, and that is too much time to waste on something that might not work out. Actually, everything I read makes me think that 4 weeks it really more realistic even for the simpler recipes and even more for more complicated ones. Looking around on the Mr. Beer website and forums really gets me excited about this. I guess I have to be patient. Ok. It is official. Congress has counted the votes and I am finally willing to call Obama President-Elect. According to a map I looked at today, Obama was supposed to win 364 to 174, but it turns out the extra vote came from Nebraska, which as you know if you read my previous blogs on Electoral College (and chose to clutter your brain with this piece of information), Nebraska is one of the two states that actually has the system to split its votes. So, probably, the map of the November election results was simply too lazy to split out Nebraska's Obama vote. It is apparently not typical that people were watching Internet news stories today to see the results. Most people figured that the presidential race was a done deal. Practically speaking, it was, but I was holding out hope that something unusual would happen. It probably would not be good for the country for 90 - some EC voters to switch over, but I was hoping for a little more excitement than one vote from Nebraska going to Obama... especially since that is what that voter was probably supposed to do. I am pretty sure this is the first time either Nebraska or Maine has actually split up their votes, so we do actually have something a bit unusual. I guess I'll have to take it. By the way, Inauguration Day is Tuesday, January 20, 2009. 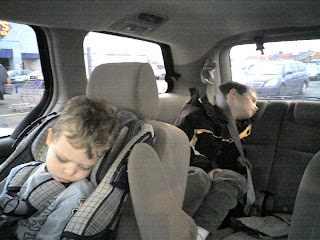 I am sitting in our van with two sleeping kids outside of Sam's Club waiting for Tracy to finish buying groceries. We spent most of today in the Denver Museum of Nature and Science. The kids really enjoy spending time at the museum . We are members and really get our money's worth of the membership. We go alot. 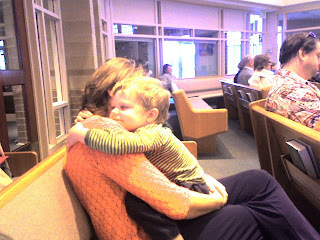 Yesterday, we got home from visting my sister's family up in Hudson, WI. It was very cold up there for our visit. Denver's weather was in the 50s and 60s while we were up there. It was well below freezing in Wisconsin. We saw several below zero temperatures. It was nice to visit, though. It is so much to see our two boys with their cousins, and as always my sister and her husband did a great job planning activities and entertaining us. We got back to a voice mail from a neighbor that our outdoor faucet had been leaking badly. They were able to get our water turned off which was certainly nice of them. We had to call a plumber to fix the problem. To get it replaced, he had to cut holes in our guest bedroom wall. But all in all the whole thing was relatively painless for us. It certainly could have been much worse. I have noticed that it is hard to recover from vacations. I am not a pioneer in this discovery. Everyone says the same thing. Generally, I get frustrated at the health club every Janurary because of all the extra people apparently making resolutions. Luckily they are always gone by mid- February. This year Bally does not seem nearly as crowded as usual so close after New Year, so this year the extra people do not bother me quite as much. I never really understand new year resolutions. If you want to change something, why not start immediately? If it is not important enough to start before a certain day, it probably is not important enough to keep up. That is why most new year resolutions do not last far into February. Tyler started basketball last night. He is almost a full head taller than the rest of the kids. He is tall for his age, but I think the rest of the kids in this immediate area are extremely tiny. Connor is closer in size to most of these kids than Tyler is. Anyway, I meant to post this blog entry 5 days ago and I do not really feel like continuing on this any longer so I am going to send it. Denver, Colorado, (Jan. 6, 2009) -- Denver based Automated Event System Inc, DBA Auction & Event Solutions announced today that it has completed its merger with Auction Automations, LLC., creating an auction technology and services firm that will be better positioned to more effectively service the national non-profit industry. The company retains the Auction & Event Solutions name and continues to operate in Arizona, Colorado, Illinois and Texas. "The merger combines one of the largest and most recognized non-profit service providers with one of the most innovative and successful technology providers, creating a new Auction & Event Solutions poised to pursue growth and provide a broader range of services to a national client base , said newly appointed AES President and Chief Executive Officer Michael Wood. This merger will help usher in a new age of charity fundraising through silent auctions, both here in Chicago and nationwide. Our clients are very excited about Auction Automations' wireless touch pad bidding technology and the possibilities it allows. By automating the auction, we can begin to eliminate the errors and frustration we are all so used to seeing at large scale fundraising events. We are about to change how non-profit professionals and auction participants view silent auctions. The future is now." Ashley D. Weber, owner of Auction & Event Solutions Colorado, said, "Joining forces with Auction Automations allows AES to add and expand our existing technology solutions for our clients. The great new touch pad bidding, with the added support of AES staff and service creates an unparalleled technology and service package for silent and live auctions nationwide. While AES has been providing auction solutions for over 20 years in Colorado, we are now able to expand our offerings of services to clients in a way that was not possible before. "The merger with Auction Automations is a transformational event in the 20-year history of AES. said Louis Murad, the Owner of Auction & Event Solutions Dallas, Ft. Worth. This is essentially the creation of a new company that is equipped to pursue both local and national growth in order to better serve our clients and the nonprofit communities throughout the United States." Auction & Event Solutions is one of the largest and most respected non-profit event night services companies. AES offers the non-profit community technologies and services positioned to generate substantially more revenue from annual silent and live gala fundraising auctions. Comprehensive integrated solutions, including consulting, planning, event management, touch pad bidding, integration with Auctionpay® and Auction Source ®, and event night staff provide a turnkey source for the non-profit community. For more information regarding Auction & Event Solutions and the merger, please visit www.AESAuctions.com.